I'd like to thank Rowenta for inviting me to attend the Ecco Domani Fashion Foundation Show and the Rowenta Reception. I sipped on champagne in the lobby of the Mercedes-Benz Fashion Week tents, and then was escorted in to the sponsor seating area and enjoyed the show. Afterwards, we were escorted to the backstage Rowenta lounge for the reception. Guests enjoyed hors d'oeuvres and champagne, the perfect end to a long day. It's always comfortable to be in a venue that isn't overcrowded. This is the second season that Rowenta is the official provider of garment care at the Bryant Park Tents. I've been seeing Rowenta everywhere, from The Daily Beauty Bar to the Javitz during Curvexpo and Coterie. As I left the reception, I was excited to receive the Rowenta Ultrasteam handheld fabric steamer (model DR5020). If you don't currently have a steamer, I recommend picking one up. 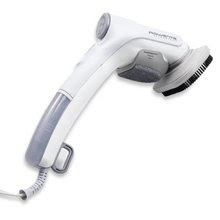 I have a Rowenta commercial steamer at home that I can't live without. This handheld steamer is going to be perfect for me to leave at work for touch-up de-wrinkling before I go out to events. Just sitting at my desk all day leaves wrinkles in my blouses and dresses (just don't ever try to steam anything while you are wearing it!). So I tried the handheld steamer on a really wrinkled pair of Genetic Denim jeans. The steamer was ready in half a minute and I was able to get all the wrinkles out after some repeat steaming. I also tried steaming a chiffon blouse and because the fabric was delicate and thinner, it took out the wrinkles even more quickly. The water in the tank is quickly used, so be sure you have enough water available. It also comes with a large removable fabric brush and a travel bag to easily tote around. Even if you are familiar with using a commercial steamer, make sure you read the directions on a travel steamer, as there are certain instructions you need to follow. You definitely want to remove the lint pad before using, as excessive water or steam can cause the lint pad color to run. You also want to be sure to empty out remaining water after using, and rest the steamer on it's side on a flat heat resistant surface. Happy steaming!